Osso bucco — a Wednesday night special at Centonove. 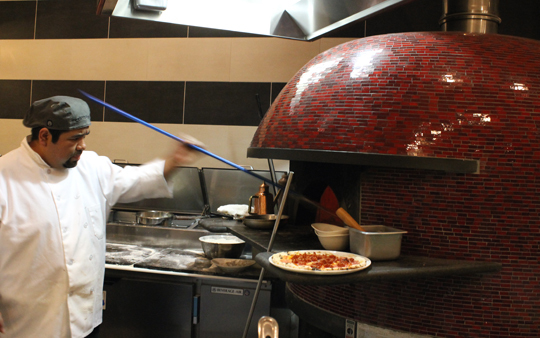 Centonove, the newest restaurant to open in Los Gatos, welcomes you with Italian gusto. Step inside its compact, convivial black and white dining room with splashes of marinara red, and you may hear Executive Chef Carlo Ochetti heartily conversing with customers in his native Italian. 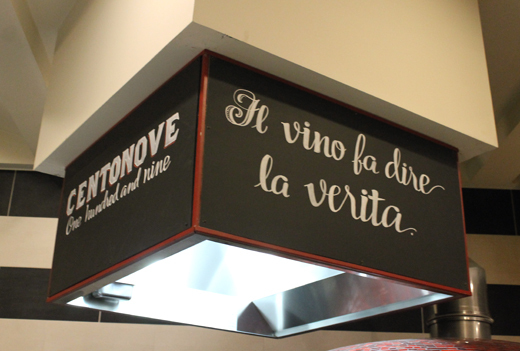 Indeed, Centonove (Italian for “109,” its numerical address on W. Main Street) is like a neighborhood trattoria transported from Italy to the South Bay. Shelves lining a brick wall are stacked with wine bottles, packages of pasta (even gluten-free ones), and big cans of tomatoes to give the feel of an Italian groceria. Small tables fill the main room, which also sports two bar areas — one to enjoy a quick coffee, the other known as the chef’s counter because it fronts the kitchen, including the red-tiled, wood-fired pizza oven. That’s where Ochetti, formerly of San Jose’s Il Fornaio, holds court. 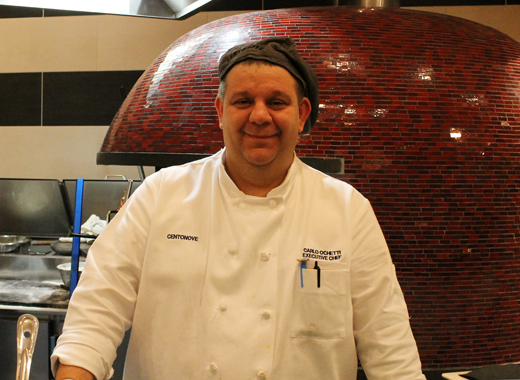 He chats easily and often with diners at the black marble chef’s counter, asking how everything is or explaining how a dish was put together. That’s where my husband and I sat when we visited recently. Although we paid our tab, Ochetti sent out a few extra tastes on the house. A little slice of Italy in downtown Los Gatos. The decorated hood in the kitchen. 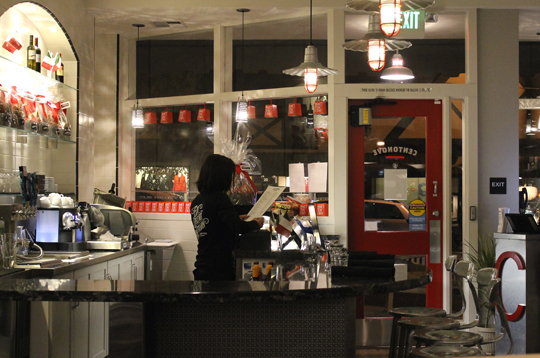 Centonove was opened by Lisa Rhorer, who also owns Cin-Cin Wine Bar in Los Gatos, and business partner, Pasquale Romano. Like Rhorer, he also comes from a background of high-tech. Rhorer, a certified sommelier, is also in charge of the wine program. It’s a good-sized wine list, particularly given the compact size of the restaurant. The wines offered hail almost exclusively from Italy, save for the 2013 Centonove House Red (Alfaro Family, Santa Cruz Mountains). Wine flights are also offered. 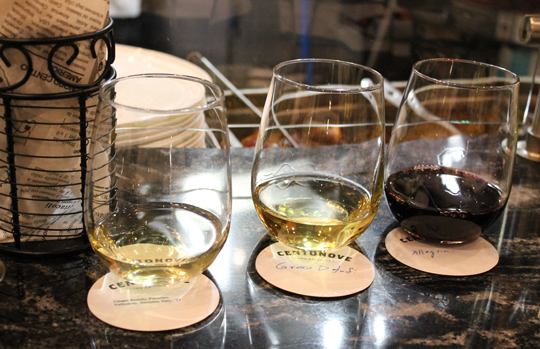 The restaurant will even customize a wine flight for you. Each night, there are a few additions to the menu, as well as a nightly special, such as seabass alla Milanese on Fridays or spaghettii con polpette on Sundays. We were there on a Wednesday night, so my husband, aka “Meat Boy,” couldn’t resist that evening’s special of Ossobucco di Agnello. 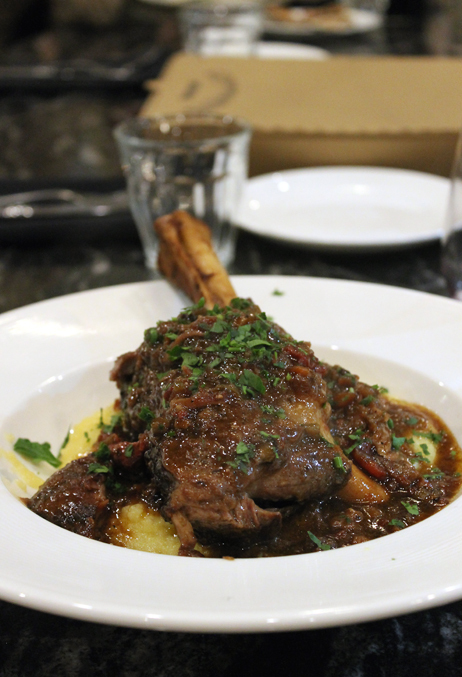 Braised for hours with wine and rosemary until silky tender, the massive lamb shank rested on a mound of creamy polenta. 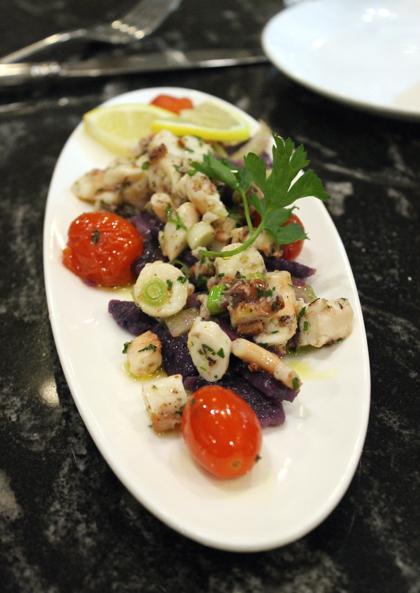 We started the night with the wood-fired octopus ($10), served with purple potatoes, roasted tomatoes, celery and a zesty lemon vinaigrette. Ochetti explained that he cooks the octopus for about 90 minutes in a big pot of water with a wine cork to make it supple. Then, it gets finished in the wood-fired oven so it’s kissed with just a little smokiness. Octopus, boiled with a cork — the old-school Italian way. 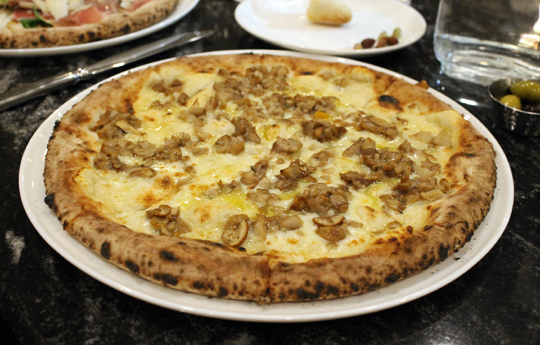 As the menu indicates, Centonove’s pizzas are done in the Neapolitan-style, meaning they’re soft in the center, chewy on the edges and practically foldable. If you’re looking for a crackling crisp crust this is not the one. 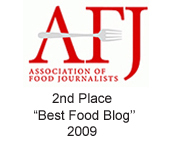 But that hardly matters, given how flavorful the crust alone is. It tastes like artisan bread with its full, developed flavor thanks to the Italian-flour dough being allowed to rise for 24 to 48 hours. 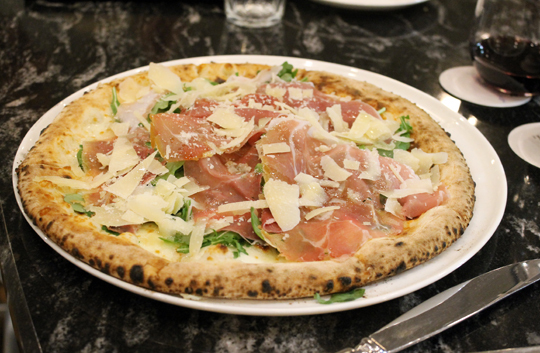 The Prosciutto Crudo ($14) is baked with fresh mozzarella. When it comes out of the oven, a handful of peppery arugula leaves go over the top with a drizzle of truffle oil. It’s one of my favorite combinations because of the sweet-salty, rich prosciutto layered underneath the bright, fresh greens. The Funghi E Fontina ($12) is strewn with bits of porcini, roasted garlic, thyme, parsley, and fontina cheese before getting a final flourish of porcini olive oil. Earthy and garlicky, it’s a savory sensation. Pizza with prosciutto and arugula. With the exception of the dried ones, all the pastas are made in-house. 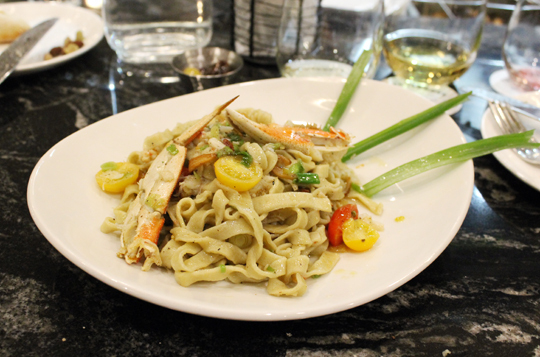 A special that night was the fettuccine with crab, white truffle oil, vodka, and roasted cherry tomatoes ($21). The pasta had a nice, chewy toothsome quality. Long green onion stalks garnished the plate, which were an unnecessary embellishment. The fettuccine was coated in a seafood-infused stock, accentuating the pieces of sweet, fluffy Dungeness crab. House-made strands of fettuccine tossed with fresh Dungeness. 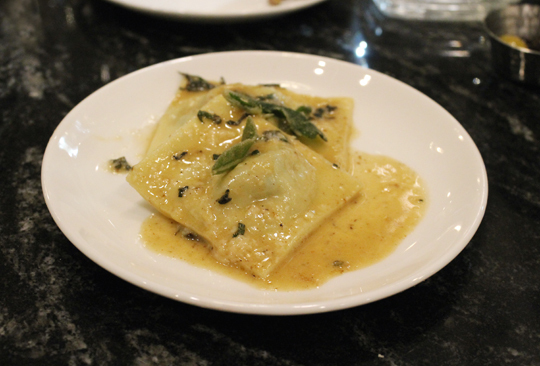 A sample of the exquisite ravioli — also made in-house. The chef sent out a tasting portion of his best-selling pasta dish: Ravioli Al Cavolo E Mascarpone ($12 for a full serving). I can see why it’s such a hit. The tender house-made ravioli are filled with a mxiture of mascarpone, Parmesan, pine nuts and not the usual spinach, but the “It” green of the moment, kale. The ravioli get napped in brown butter sauce and garnished with crisp sage leaves for a nutty, comforting and lush dish. 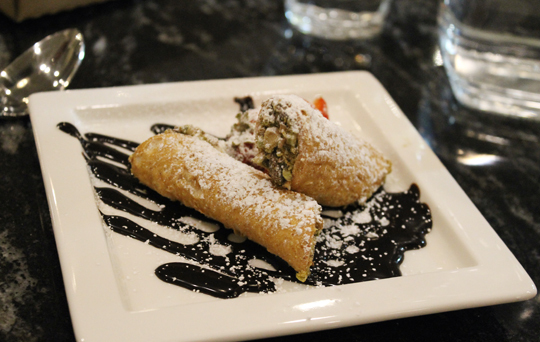 Cannoli shells are imported from Italy, then filled to order with a creamy blend of ricotta, pistachio, candied citrus and chocolate chips before being dusted with powdered sugar and placed over drizzles of chocolate sauce. It’s a classic. 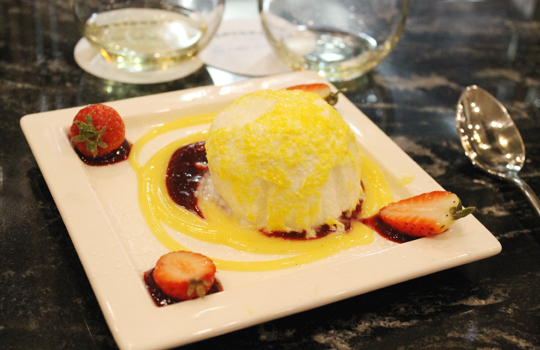 Limoncello Al Tartufo ($6) may look like one of those grade-school snowball snacks, but it’s really a ball of limoncello gelato with a hidden center of limoncello gel, all covered in meringue sprinkles. It makes for a very refreshing ending. Centonove is one of those places you wish every neighborhood had — because you just want to return to it again and again. The food and wine at Centonove are as good as they look, wonderful! 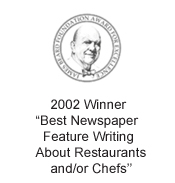 We have dinned there and everything we had was terrific. Lisa has compiled a great wine list with a winner in every price range. 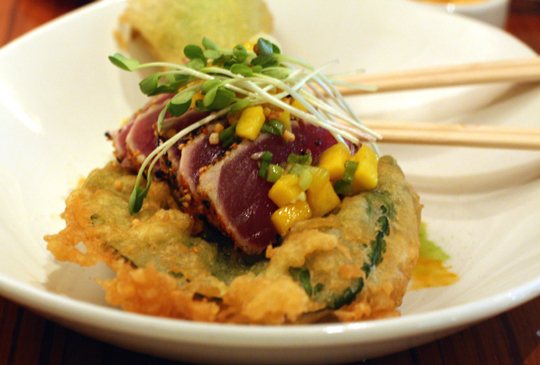 One of our favorite places in Los Gatos. Oh my. Oh….my. That ossobuco is amazing as is all of the other dishes. Oh to go and just taste it all. 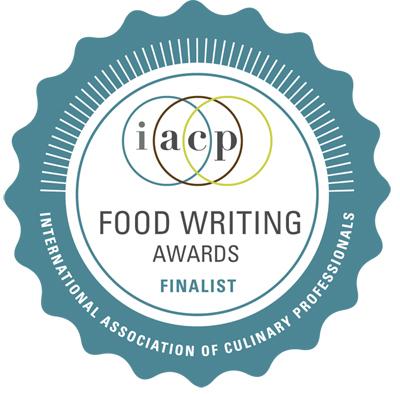 You live in some wonderful food city! Wow, everything looks amazing. It’s hard to resist ossobuco, but that ravioli looks terrific. Sounds like a wonderful place – thanks. Oh my gosh all that food looks divine! I’m loving that fettuccine! 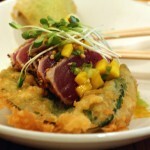 Everything looks good, and this sounds like a great place to dine in with family and friends!